When the Spanish conquistadors landed in Mexico, they were confronted with a civilization that was powerful, sophisticated and characterized by an elite warrior culture. While Cortéz and his followers failed to appreciate many of the subtleties of Aztec culture, they were particularly impressed by their fierce fighting style and unusual weaponry. According to historian Ross Hassig, the macuahuitl was one of the most iconic Central American traditional weapons, Resembling a flat, wooden paddle studded with pieces of sharp volcanic glass, this formidable sword struck fear into the hearts of the Aztecs’ foes. This drawing, from the 16th century Florentine Codex, shows Aztec warriors brandishing macuahuitls. Aztec military strategy involved a number of different types of weapons, some of which the Spanish invaders had encountered before. The Aztec fighters were armed with shields, bows and arrows, slings, clubs and specially designed spears that were used to target the unprotected legs of their opponents. However, the large wooden paddles wielded by Aztecs were a source of intrigue for Cortéz and his men. The macuahuitl was a wooden sword in the shape of a cricket bat, usually carved from oak or pine to a length of between and 1.5 and 3 feet (0.5 m – 1 m). It had a long, narrow handle that branched out into a wide blade. 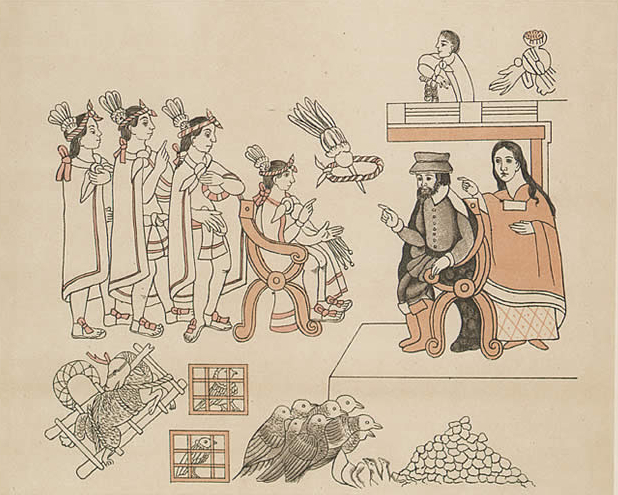 Cortés and La Malinche meet Moctezuma in Tenochtitlan, November 8, 1519. What made the macuahuitl distinctive, however, was the narrow edge carved into each side of the blade, where incredibly sharp pieces of obsidian (volcanic glass) could be inserted. According to historian Marco Cervera Obregón, these pieces of obsidian were sharp, shiny and cruel, each around 1 ⅛ inches (3 cm) long, and fixed in place with bitumen, a naturally occurring adhesive. The effect was terrifying. The jagged edge of the macuahuitl could be used to inflict terrible damage on opponents, and once the conquistadors came to recognize the weapons, they often paled in fright at the sight of them on the field. The technology involved in producing such weapons was highly sophisticated. The Aztecs quarried their own obsidian, which was a material that could be manipulated into some of the sharpest tools and weapons known to man. Factories were established to refine the obsidian into small, sharp blades so that it could be inserted into the macuahuitl in a process called “knapping”. The Aztecs were not the first or only tribe in the Americas to produce weapons in this way, but the macuahuitl has become closely associated with them as it developed into their preferred method of attack. 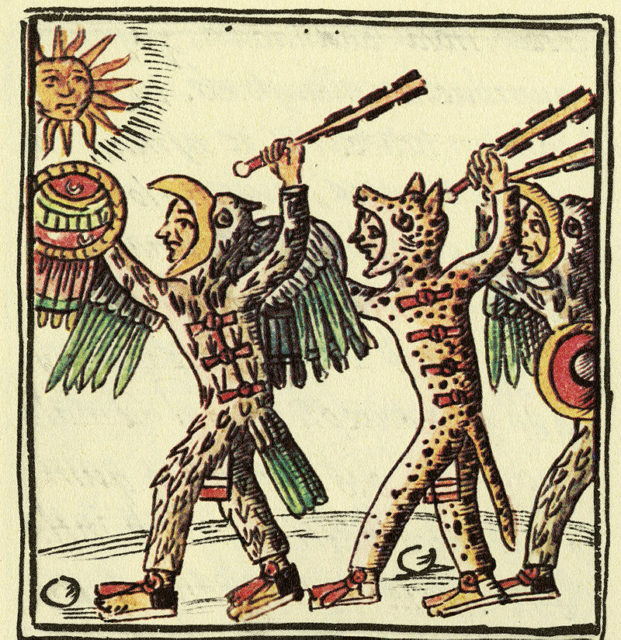 Aztec warriors as shown in the 16th century Florentine Codex (Vol. IX). Each warrior is brandishing a maquahuitl. The advantage of these fierce weapons was their flexibility as an all-purpose sword that could be used in close-quarter fighting, as Cervera Obregón describes. While bows and arrows may have been more efficient, they had a high attrition rate, and spears were difficult to maneuver in jungle territory. When the Aztecs came face-to-face with Cortéz and his men, the conquistadors were shocked at the power and efficacy of the macuahuitl. 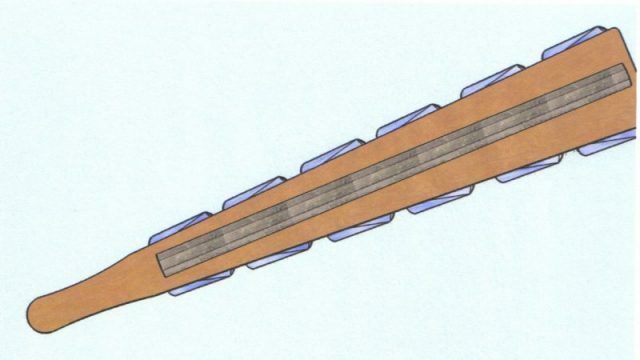 One eyewitness account stated that the macuahuitl was powerful enough to make dents in the iron armor of the Spanish fighters, and at one point, even took the head off a horse with one blow. However, modern anthropologists are skeptical that the macuahuitl would have been capable of inflicting such an injury. Rather, they believed that the swords were used to inflict grievous injuries that would halt their enemies and allow them to be taken as captives. The size and structure of the weapons meant that it would not have been able to inflict very deep cuts or sever anything substantive. 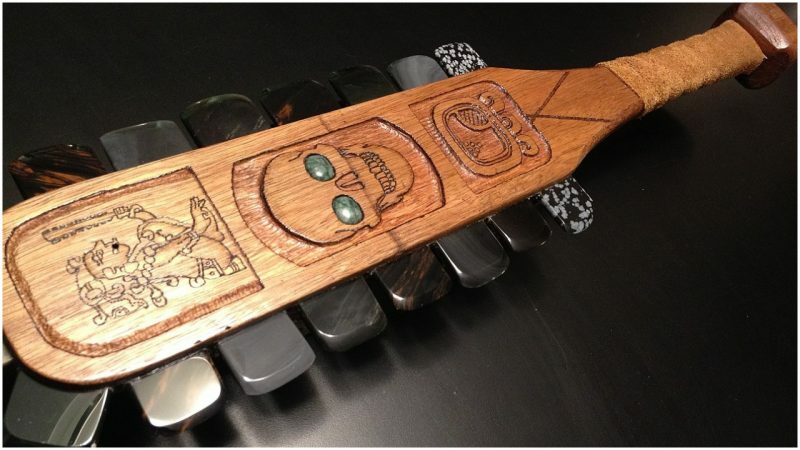 However, it’s difficult to know for sure how the macuahuitl was used as there are no original surviving examples. When the conquistadors conquered Mexico they gathered together all of the weapons of their vanquished foes and set fire on them, in a striking display of victory designed to prevent any further uprising. Although Christopher Columbus and other explorers did take examples of the weapons back to Europe, only one survived and was placed in the Royal Armory in Madrid. Sadly, in 1884 a fire broke out in the Armory, and the last surviving example of the macuahuitl was destroyed. Now it exists only in pictures, in both Spanish and Aztec sources, just a fragment of a memory of a lost great culture.